This film project shows how art can fuse with environmental science and community engagement to protect and preserve fragile and endangered ecologies. Since EASF’s founding in 2007, the number of Florida artists engaged in the demanding trans-disciplinary practice of EcoArt has doubled! And they are creating stunning, ecologically productive artworks at the rate of 1-2 a year. The project documents the phenomenon of EcoArt’s growth in South Florida, addressing the ups and downs of the journey. The film’s perspective will be through the eyes and experiences of the artists and their collaborators who will candidly respond to the key question: “Why EcoArt?” EcoArt South Florida believes their story of how EcoArt has become a powerful force, in a state with multiple, serious ecological problems, can spark the emergence of similar trans-disciplinary efforts elsewhere. EcoArt South Florida is teaming up with Miami filmmakers Southern Land Films to mark EcoArt practice’s arrival at “critical mass” stage in the region. Our documentary, which is already underway, will profile 11 of the seventeen EcoArt works that have been completed or are in progress. It is thrilling that their efforts to catalyze the emergence of South Florida as a new, vibrant center for EcoArt practice are working! The route will begin at a location TBD in North Park and will conclude at Art Produce (3139 University Ave, San Diego, CA 92104). Participants must be able to walk, run, and/or roll the entire route. The route will not exceed 1 mile in length. The Green Art Parade will occur on two dates, Saturday, July 13, 2013 and Saturday, August 10, 2013 from 7:00 – 8:00pm. An artist’s reception at the Art Produce gallery and garden will immediately follow each event. The parade will coincide with North Park’s Ray@Night (www.northparkarts.org/). ELIGIBILITY: This call is open to all artists residing in Southern California. Artists living in San Diego are especially encouraged to apply. CRITERIA: Selected artists / teams will have experience creating artworks that express green design theories, utilize green materials and techniques, or express a significant environmental concern; have previously demonstrated a successful collaboration on a project; and are available to participate in a minimum of two public art parades. Five digital work samples of similar past projects. Identify each project with a title, dimensions, location, and year. Video clips should be no more than 5 minutes long each and included as links to YouTube, Vimeo, or your website. 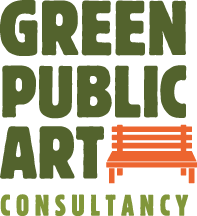 BUDGET: While Green Public Art Consultancy believes in paying all artists for their time, this project is strictly voluntary and does not have funding available for artist fees or materials. Green Public Art fully supports artists who wish to find outside funding to realize their project. PLATFORM have been at the heart of a critique of corporations and carbon for more than twenty years. They have entered into long term partnerships with environmental ngos, appeared at Glastonbury, commissioned and created artworks, as well as produced books and films. They have also founded a business that delivers micro renewable solutions for businesses and homes in London. Their latest book, following on from the hugely important The Next Gulf, is The Oil Road, reviewed recently in the Guardian. The Next Gulf focused on Shell’s involvement in Nigeria. The Oil Road is focused on travels that Mika Minio Paluello in particular made along BP’s Baku-Tbilisi-Ceyhan pipeline from the Caspian to the Mediterranean. Exploring oil from experience on the ground is always more revealing. These books are always well researched, historically informed, thoroughly post-colonial and fascinating. 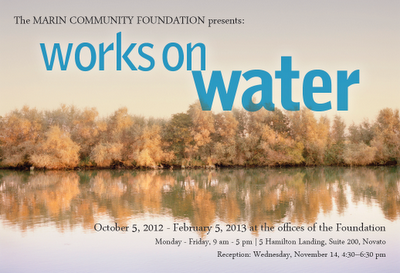 Works on Water opened at the Marin Community Foundation on October 5th and will be up through February 5th, 2013. This is the second of three exhibitions curated by Patricia Watts of ecoartspace for the foundation over a year period. Included are 30 artists and 120 artworks that address water issues in a wide range of media and focus. To see a list the artists and images of the works please go HERE. Given the extreme water scenario we find ourselves dealing with here in the USA with Hurricane Sandy on the East coast and a severe drought in the Southwest, this exhibition could not be more timely. The foundation offices are open Monday through Friday 9-5pm and admission is FREE. For more information and directions to the foundation please visit the Facebook event page HERE. Tate Trustees have decided not to accept ‘The Gift’, a 16.5m wind turbine blade, as part of its permanent art collection. ‘The Gift’ was installed in Tate Turbine Hall in an unofficial performance on 7 July, involving over 100 members of Liberate Tate, the group that has made headlines for dramatic artworks relating to the relationship of public cultural institutions with oil companies. The artists submitted official documentation (see below) for the artwork to be a gift to the nation ‘given for the benefit of the public’ under the provisions of the Museums and Galleries Act 1992, the Act from which Tate’s mission is drawn. The refusal of the offer comes despite the fact that more than a thousand people signed a petition started by a Tate member calling on Nicholas Serota and the Tate board to accept the artwork and return the blade to the Turbine Hall for public viewing. Giving Liberate Tate 7 working days’ notice, Tate also said that if the art collective did not respond by 16 October, it would “recycle” the artwork. (The full version of Liberate Tate’s response can be found in the Notes).The decision comes at a time when controversial art sponsors have again been in the news. Last week the National Gallery announced that its sponsorship agreement with arms dealer Finmeccanica was ending a year early following on from protests and public pressure. The Gift is Liberate Tate’s fourth artwork in the Tate Modern Turbine Hall. Opening on June 2nd 2012 and running until September 30th 2012, Manifesta 9 takes place in the former coalmining complex of Waterschei in Genk, Limburg, Belgium. Manifesta 9 is an assembly of artworks, testimonies, and participants inviting the viewer to rethink the role of culture in industrial and post-industrial societies. For its ninth edition, which take place in Limburg, Belgium, the curatorial team, composed of Cuauhtémoc Medina (México), Katherina Gregos (Greece) and Dawn Ades (U.K.) has developed a concept creating a dialogue between different layers of art, heritage and history. The point of departure of Manifesta 9 is the significance of the former coalmining region of the Belgian Campine, as a locus for different imaginary and ecological issues associated with industrial capitalism as a global phenomenon. To celebrate thirty years of groundbreaking international theatre across London, LIFT partnered with Arts Admin., as part of the IMAGINE 2020 network, to commission a new piece of public art work in central London. Michael Pinsky, a renowned British artist, who has created artworks in public spaces and galleries across Europe, won the commission. His work will respond to the issue of climate change. This secret project will be launched 7 February 2012. Stay tuned for more details. From the 7th to the 24th of February the exhibition SurVivArt – Art For the Right to a «Good Life» takes place at the galleries Mikael Andersen and Meinblau in Berlin. International artists from Ethiopia, Cambodia, Myanmar, Nigeria, Thailand and the Czech Republic were invited to do a reflection on the meaning of the right to a «Good Life». From these reflections arose various works of art and related communications on what the “good life“ means to them and people around them. Often the project started off the communication between artists and local communities about sustainable practices in their home country. 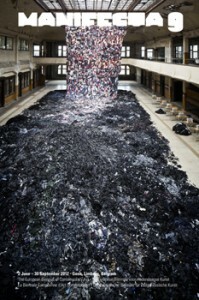 The artworks touch upon many aspects of our everyday life: Habitation, food, clothes as well as consumption. The works will be shown at the exhibition, which opens at the 5th of February. The Heinrich Böll Foundation developed SurVivArt with the help of its offices around the world. The project was inspired by the initiative ÜBER LEBENSKUNST from the Kulturstiftung des Bundes and aims at connecting sustainability, climate change and gender equity with the arts and culture. Among others the works by artists Kebreab Demeke, Robel Temesgen, Alafuro Sikoki, Segun Adefila, Adebimpe Adebambo, Oeur Sokuntevy, Neak Sophal, Tith Kanitha, Nino Sarabutra, and Phyoe Kyi will be shown at both galleries. The conference Radius of Art takes place in parallel (February 8/9, 2012) and fosters international dialogue and exchange of ideas between culture, science, and politics. Opening hours of the exhibition are Tuesday to Friday 12 noon – 6 p.m. and Saturdays 11a.m. – 4 p.m. Opening: 5th February 2012, 6 p.m.
ANDANDAND made the following announcement through the dOCUMENTA (13) newsletter (who, it should be noted, added “dOCUMENTA (13) is not responsible for the views or factual claims expressed by the artists and artworks it presents.”. “Our focus is on Monsanto’s role in transforming and damaging the ecologies, economies, and social relations of this region. Proceedings will unfold in several stages, and as the deliberation process builds, it will add to the accumulating record of harms perpetrated by this corporation against human and non-human bodies, food, biological processes, weeds, neighborhoods, farmers, alternative forms of knowledge, and finally the environment from which all these entities emerge. Through this project, we challenge rigid categories of legal protection, and seek an ethics that protects life itself from coercion. We invoke the form of a trial to produce a comprehensive public understanding of harms, and to determine responsibility for those harms. 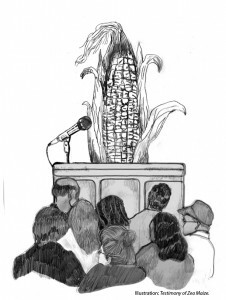 Existing judiciary frameworks are inadequate to the scale and nature of the ongoing damages perpetrated by Monsanto, which, under current law, is granted the rights of a legitimate “person,” while human non-citizens and non-human agents in our biosphere are not recognized. Existing law produces exclusive notions of legitimacy and harm that ignore and damage entities that do not favor a reductive calculus of profit. Midwest Radical Culture Corridor has undertaken a number of drifts with the likes of Temporary Services and Brian Holmes. Their Call to Farms project and publication is inspirational.